The 1650 local service to Baltimore departs Washington Platform 14 on a snowy, cold winter evening. Bear in mind that, although some routes don't appear very large as a download, they all take about the same amount of disk space as each of the default routes. Newer routes are becoming more feasible to download because developers are using Route Riter to reduce the size of the download zip file. Route Riter checks the route's files and takes out any which are from the default routes. It then builds a batch file which will copy over any files from the default routes on the user's computer. Another requirement is that you will need to have all the MSTS routes installed because authors of these alternative routes use various objects and landscaping from parts of all the default routes. When you use any of the routes for the first time, MSTS will tell you it's generating terrain buffers. The time for this process can vary - on webTrainSim's machine, LGV Med, for example, took nearly an hour but others were less than this. As yet there are no Australian routes, possibly because the digital elevation data required for laying out the countryside and track, is only available commercially (as far as webWiz can ascertain). If you have any questions about the following routes, mail me at webmaster@wehdotwiz.zzn.com and I'll try to help. Don't think the routes here are all that the freeware MSTS community has made available! These are the ones webTrainSim has thus far installed. 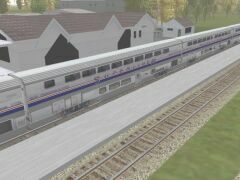 Use the Browse a Section facility at the Train-Sim.com file library, for example, to view many, many others, and then visit various U.K. and European MSTS sites for more (use the webTrain sites page). The Amtrak service about to depart Jacksonville on the Florida Funnel route. As of 02-Nov-02, Bjoern Arlt has been upgraded the route to Version 2. 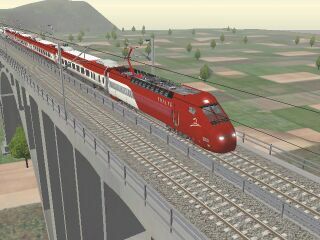 You'll find it as fbline2.zip (16.2Mb, 31-Oct-02) in the Train-sim.com library or you can download it from Bjoern's site. The site also has useful information to help with any installation problems, details about the new activities, maps and signals, and FBL-liveried rolling stock. Version 1 is available in the Train-Sim.com file library in fbline.zip (9.6Mb, 12-May-02), with a small fix in fbl_fix2.zip (5kb, 28-May-02) and can remain installed alongside Full Bucket Line version 2 since they use separate sub-folders in your Routes folder. The Full Bucket Line, a small fictional desert-style route, has been expanded to about 70 miles track, 10 mainline stations, 2 branch line stations and several switching yards. Twenty-two activities are included and all these activities use default MSTS rolling stock. Using ConBuilder, you can quite easily change the consists in these activities to your choice of rolling stock. in the Extract to: folder path text box (enter this path manually or click your way through the folder tree in the Folder/drives box). Then run the runme.bat batch file to bring in other files from other MSTS routes. Easing into the Simonville platform. This route is available in the Train-Sim.com file library in flfunnel.zip (17Mb, 16-Jul-02). A set of activities is available in flfunpak.zip (129kb, 26-Jul-02). Note that to run these activities, extra rolling stock, over and above the default MSTS rolling stock, is required (a list is given in the "readme" in the zip file). The Florida Funnel is a route based on the CSX prototype from Waycross, Georgia, to Jacksonville and Baldwin Florida. This is a mostly flat and straight route with a minimum of shunting (switching). After installing the route, there is a comprehensive information page and maps. An introductory activity is installed along with the route and this activity uses only default MSTS rolling stock. However, the author provides a pack of 17 activities in the fun pack but these require extra rolling stock. Before installing, read through Luc's instructions in his readme. webTrainSim had no difficulty with the installation. Use Luc's activities to familiarise yourself with driving TGV trains and the route. Here are some screenshots which show the new features of the route that webTrainSim is learning. For those of you reading this and wondering why all the fuss, then visit LGV Med's author's site at perso.wanadoo.fr/lucweb/lgvmed/eng/ for activities, screenshots, route description, signalling, FAQs and a driver's manual. LGV Med assumes you've purchased the Speedworks TGV Addon Pack 1 by Clem Tillier. 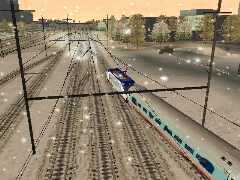 For just $US7.95 (about $AU15) for four TGV trainsets, with a cabview that uses the TVM430 in-cab signalling system as required on LGV routes, you'll experience the full thrill of being in control of a modern high speed train. The LGV Med route version 1.0 became available at the Train-Sim.com file library in file lgvmed.zip (19.9Mb) at the end of July. The webTrainSim roundhouse already had Chris Longhurst's Eurostar which had some of its cobwebs removed now and then on NEC. The LGV Med was just the route on which to let the Eurostar show its potential - with a few tweaks (see Eurostar on the LGV Med). Installation of LGV Med is straight forward, except the batch file may not create the route's Sound sub-folder, as noted in the readme. After extraction, open Explorer to check if you have the Sound sub-folder under the Routes\LGVMed folder. If not, create it and run Installme.bat again. No harm is done with this second running of the batch file - webTrainSim had to do this step. The consists for the included activities weren't in webTrainSim's download zip but that's no problem. Running ConBuilder and checking these activities, you'll find that a consist named tgvres1.con is missing. It's a simple task to make one. Open Explorer and navigate to the Train Simular consists folder. Look for a consist named Eurostar FR.con. Make a copy of this file (click Copy then Paste on the toolbar). Scroll down the end of the file list and rename Copy of Eurostar FR.con to tgvres1.con. End of comments about LGV Med version 1. There is much spectacular scenery over the Marias Route. Here Amtrak Empire Builder crosses this trestle bridge outside Glacier Park. After a time you feel like you're riding a roller-coaster when driving across the default Marias Pass. MP3 installs in its own right and you can compare the two - you'll soon prefer MP3. There are many updates in MP3, particuarly re-laying the track to take out the big dips and sharp grades, several of which are an unrealistic 5% in the default MP route (2% in real practice is a severe grade). Another feature of MP3 is repositioning the mile posts on the actual mile marks. As well, the MP3 designers have set all the signalling, as far as possible given the constraints of MSTS, to the standards used by BNSF, the owners of the Marias Pass route. Consequently, BNSF work orders for the Marias Pass route have been used too. mp30act2.zip (02-Jan-02, 213Kb). The set of activities in mp30.zip will give errors so they were re-saved in the MSTS Activity Editor and are included in this down. There is an accompanying document that gives information on what changes were required to get these activities to work (or not!). webWiz certainly recommends MP3 and you'll find many activities specifically designed for this route. It's a far more enjoyable experience! XPT, in candy colours, at speed. 2002 is the 20th anniversary of the XPT in Australia, particularly on NSW lines. Modern England is a fictional, electrified route, using modern signalling so is a good U.K. route to supplement the default Settle-Carlisle. The full version 3 of Modern England has been available since March from UK Trainsim but not everybody could get in to download it. 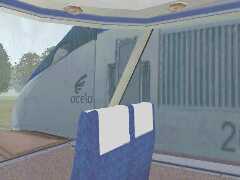 Now it's available from the Train-sim.com library modeng3f.zip (18.9Mb, 30-Oct-02)so there's no excuse! This version removes any need to have specific rolling stock (as the early version from Train-sim.com did) and includes plenty of default paths for exploring its full length. If you can run the Activity Editor, you'll get a good idea of the interesting branch lines, some with balloon loops so you can make the return trip and keep driving to a new destination. You'll enjoy exploring Modern England, with about 180 miles of track and sidings. webWiz has installed this route and enjoys it, mainly because of its modern signalling. As well, you'll find its grades and landscaping somewhat similar to Australian rail conditions (similarly, the Settle-Carlisle route). It's just that an English summer still boasts green grass! One problem that is easily fixed - the catenary gantries are missing their horizontal and supporting arms. Easily fixed! At UK Trainsim, look for the download ukgantries.zip (28kb, 19-Dec-01) and extract us1gantry.s to Modern England's Shapes folder. 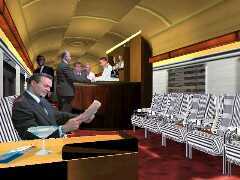 Passengers onboard the DCC003 service, while waiting for a clear, are suddenly joined at the stop by an Acela Express. The NEC2.0 route replaces the default MSTS NEC route (let's say that was version 1). There are many improvements, including better placement of signals, more stations to reflect the real North East Corridor, and more scenery. Most activities designed under NEC 1.0 also work with NEC 2.0, with a slight difference in station placement being noticeable. NEC2.0 is highly recommended (webWiz has installed it) since it is more realistic with the extra stations and better signalling. If you're going to consider installing extra routes, you may as well do so with drink in hand and soft music. For sites that have other routes, from all around the world, look through the webTrainSim Related Sites page. Browsing through Train-Sim.com's file library (choose Routes under the Browse a section at a time), you'll find many routes created by enthusiastic MSTS fans. The main problem with downloading these over a dialup line is their size. You may want to get some idea of user comments and see if there are any particular problems. Visit Train-Sim.com's main MSTS message area and Train-Sim.com's message area devoted to route creation. One particular route that has received accolades from all who have downloaded and installed it is the Seaview Route (29Mb, version 1; version 2 is being developed). There are some message posts with screenshots and you'll see many innovative objects used in this route's scenery.